Analysis: The Odyssey begins with an epic invocation, an appeal to one of the muses, the nine goddesses of the arts. The ancient audience was already familiar with the legend of Odysseus and therefore knew the plot. The man in line 1 is obviously Odysseus. The adventure described involves his return home after the Trojan War. Shakespeare does the same with Romeo and Juliet, telling the entire story in the prologue by means of a sonnet. As with all epics, the narration of The Odyssey begins in media res, which literally means in the middle of. The major events of Odysseus’ journey are told by Odysseus to Alcinous via flashbacks. the gift you promised me, and I shall tell you. Analysis: Odysseus shows his cunning by calling himself “Nohbdy” (of course, how hard is it to outwit a giant one-eyed freak?). After Odysseus pokes the Cyclops’ eye out, the Cyclops yells for help, screaming “Nohbdy hurt me!” Odysseus, although physically strong, understands that outhinking an opponent often leads to victory. “O Cyclops! Would you feast on my companions? Analysis: Moments after defeating the Cyclops Polyphemus with cunning, Odysseus shows he is as foolish as he is intelligent. At this point, an angry Polyphemus is launching boulders at Odysseus’ ships and aims via Odysseus’ voice. Odysseus tells Polyphemus his real name. Polyphemus begs his father, Poseidon, to punish Odysseus for injuring him. Odysseus learns the danger of angering the gods. Analysis: Homer employs an epic simile, an elaborate comparison of unlike subjects using like or as, to describe the aftermath of the suitor slaughter. The suitors learn a valuable lesson: make sure the king of the island is dead before you wreck his furniture, eat his food, and try to steal his wife. It’s also not a good idea to anger the gods by demolishing the laws of hospitality. Analysis: Odysseus’ luck has changed as Circe first tries to kill him and then, discovering his identity, invites him to sleep with her (note to guys: if at first the woman tries to kill you, leave. I don’t care how good she looks.). Odysseus stays a year with Circe. Odysseus’ fame has spread throughout the known world. Analysis: I can’t imagine Odysseus’ crew was too thrilled to learn they are sailing to the underworld instead of home. A visit to the underworld is an epic convention. It is in the underworld that Odysseus finds his dead mother and where the blind prophet Teiresias gives him instructions and warnings for the trip home (reason #245 for buying a GPS). this island of the Sun, the world’s delight. Analysis: During his visit to the underworld, Teiresias warns Odysseus not to kill the Cattle of the Sun. Odysseus warns his crew not to eat the Cattle of the Sun. Odysseus’ crew eats the Cattle of the Sun. Zeus destroys Odysseus’ crew. 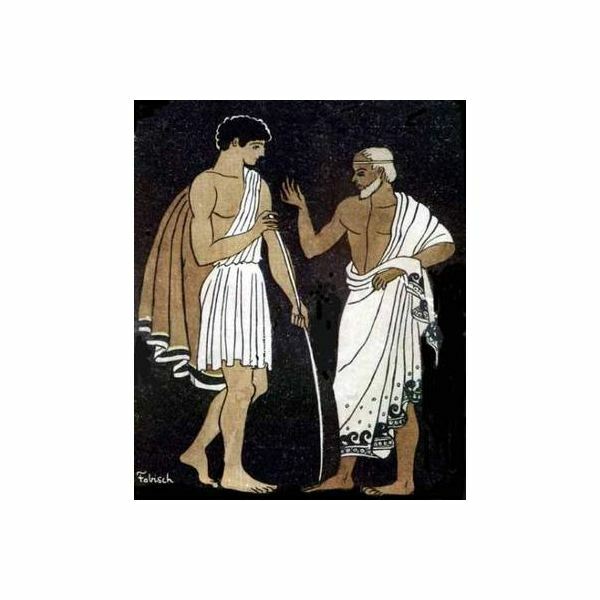 “‘Here is my lord Odysseus’ hunting bow. through iron axe-helve sockets twelve in line? Analysis: Penelope proves to be as clever as her husband, devising a test that she knows only Odysseus himself could accomplish. Perhaps she suspected the beggar to be her husband in disguise or perhaps the bow challenge is another stall. Lorcher, Trenton. His Brain. Several Readings and Multiple Teachings of The Odyssey from 1998 – Present. Public Domain Image courtest of Wikimedia Commons. Lattimore, Richmond. The Odyssey of Homer. New York: Harper Collins. 1975.